This report shows a list of all VMs with snapshots, including the oldest and the largest snapshots in the virtual environment. 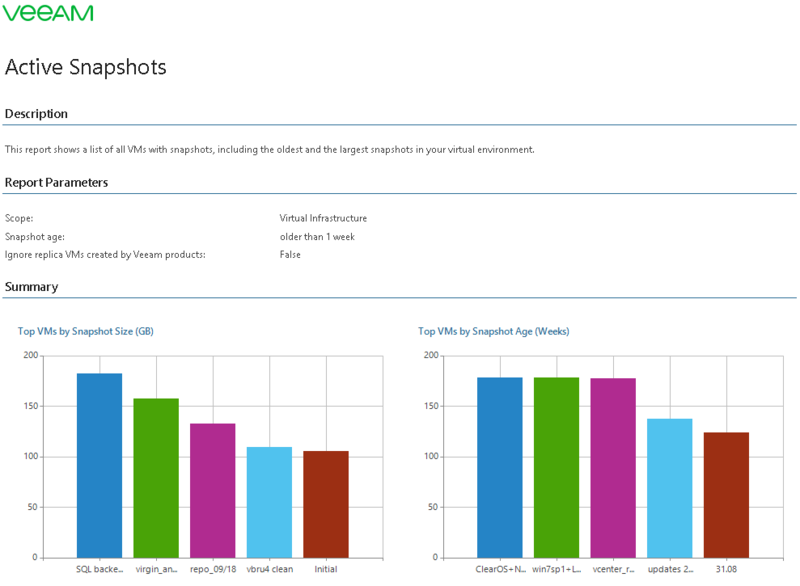 The Top Snapshot Size (GB) and Top Snapshot Age (Days) charts display top 5 VMs with the oldest and the largest snapshots in the virtual environment. The Details table provides the list of VMs with snapshots and shows snapshot name, its location, date and time when the snapshot was created, snapshot size and state of the VM. Outdated snapshots consume valuable storage resources. Best practices for snapshots recommend that you delete snapshots older than 3 days, since they no longer reflect recent VM changes. The report helps you detect outdated snapshots and better address the problem of wasted storage space. Age older than - Age measured in: defines snapshot age threshold. If a VM snapshot is older than the specified age, the VM will be included in the report. Do not report on VMs created by Veeam replication jobs: defines whether to include VM replicas created by Veeam Backup & Replication in the report. Veeam Backup & Replication uses VM snapshots as replica restore points. Such snapshot restore points may be large in size and remain on the datastore for a long period of time. If you have VM replicas created with Veeam Backup & Replication, select this check box to exclude VM replicas with snapshot restore points from the report.